Watch the video below, click the button to read the full PDF case study, or continue scrolling down for a preview. At MakeMeReach we believe that social and search are stronger together. And the results of our Black Friday campaign with TAMMY & BENJAMIN prove it! 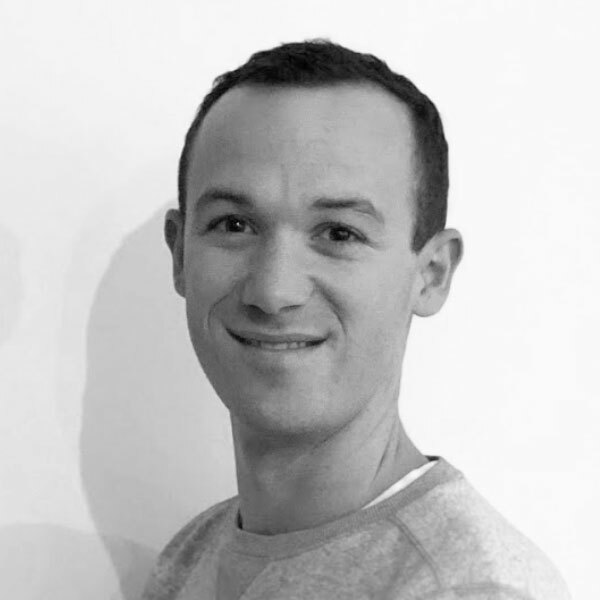 The strategy saw the MakeMeReach team focus on driving action through the full funnel on Facebook and Instagram, supported by brand search campaigns on Google. Social media networks serve as the number one source of purchase inspiration and, when coupled with the high-purchase intent of Google search, great things happen for e-commerce businesses. On Facebook, campaigns targeted english speaking users worldwide. Starting in September, the MakeMeReach Managed Service team first ran a traffic campaign to drive awareness and fill the top of the funnel with potential customers. 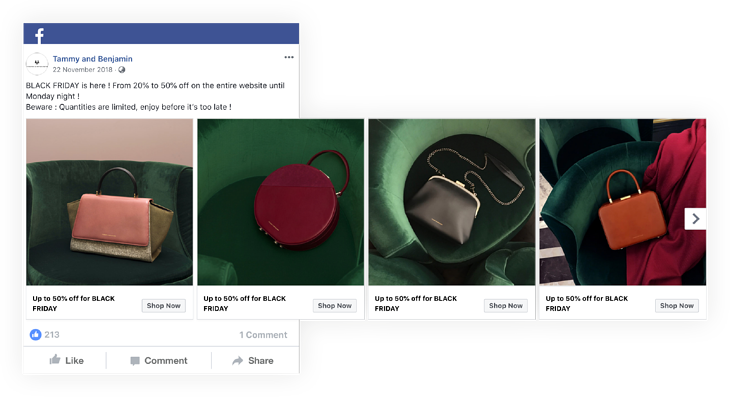 Using Facebook Link ads, Carousel ads and Instagram Stories ads, the focus was on inspiring with beautiful creative and building warm audiences that could be retargeted closer to the Black Friday sales dates. Running alongside these Facebook and Instagram campaigns, Google targeting was limited to the UK, US and France. With a strategy focused on driving brand searches on Google, the majority of the budget went on targeting brand keywords, with some reserved for generic product keywords. The Google ads featured broadly the same messaging as those on Facebook, and leveraged warm audiences from the Facebook campaigns. The Google campaigns also introduced an ‘up to 50% off’ offer between 8pm CET on the Thursday before Black Friday and midnight the following Monday. This strategy ensured a strong brand story across channels and re-engagement of users already inspired on social, while also providing a compelling offer to convert searchers with high purchase intent. “We’re happy to see that combining our Facebook and Google campaigns into one strategy paid dividends during Black Friday 2018. 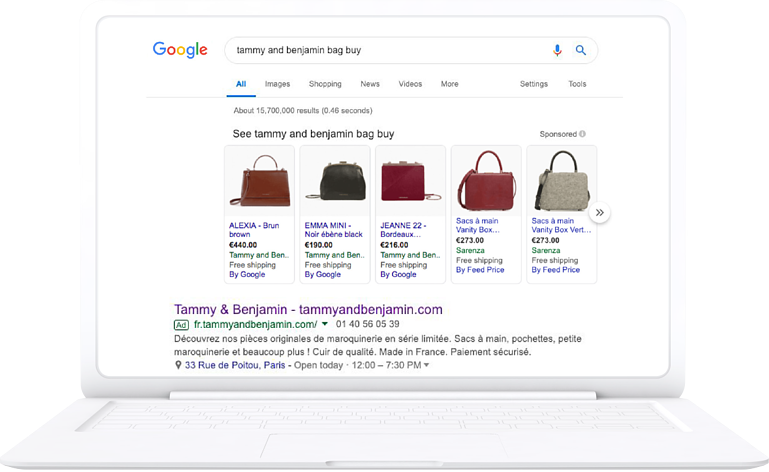 We value the strategic know-how that MakeMeReach brings to our campaigns, and adding Google to the mix means their offering is really well rounded" - Benjamin Pincemaille, Development & Partnerships, TAMMY & BENJAMIN. Interested in more retail insights to deliver long term online ads success? 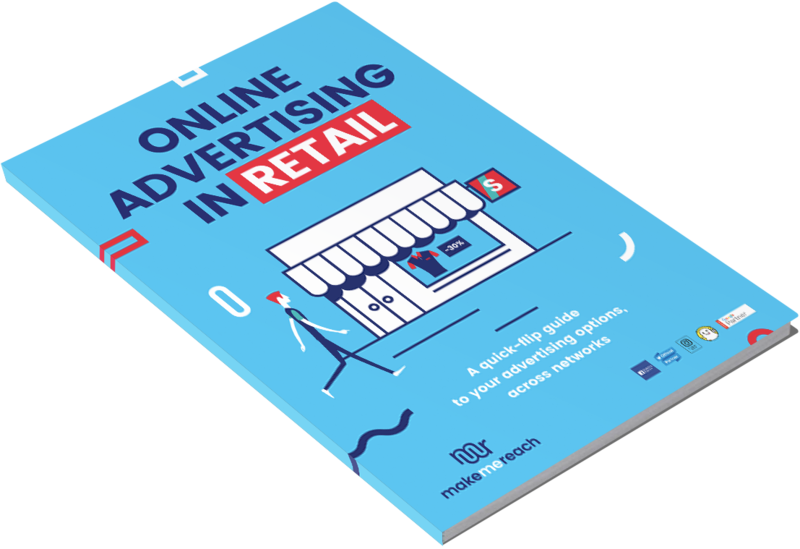 Download our in-depth Retail ads eBook!